Powdered sugar — 3-4 tablespoons. 1. Preheat the oven to 180°C. baking dish cover with foil and grease with butter. 2. For cake, beat the butter with the sugar for 3-5 minutes until fluffy status, then one by one add the eggs and continue to beat for another 1-2 minutes. 3. Carefully mix the dye with cocoa. We need the consistency of sour cream, so if necessary, add a little water. To enter the dye with cocoa butter mixture and beat at very low speed. 4. Alternately add flour and buttermilk, quickly and beating well after each addition. At the end add salt, vanilla and repaid vinegar soda. Again mix thoroughly. 5. Distribute the dough forms. Put in the oven for 30-35 minutes. Readiness check with a toothpick. Cakes must be completely cool. 6. For the cream beat the butter for 2-3 minutes, then add the powdered sugar and whisk for 1 minute until very fluffy. Enter the cream cheese and beat for exactly 1 minute. At the end add the salt and vanilla extract. To put on 15-20 minutes in the refrigerator. 7. For «blood» mix all the ingredients until smooth. 8. Cakes to spread with cream. 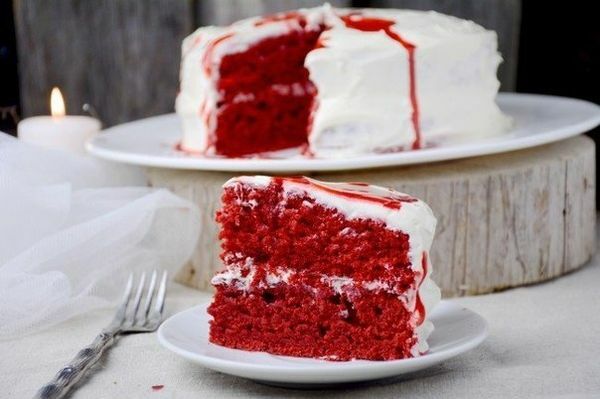 Before serving, drizzle with «blood». 9. Cake Red velvet ready!